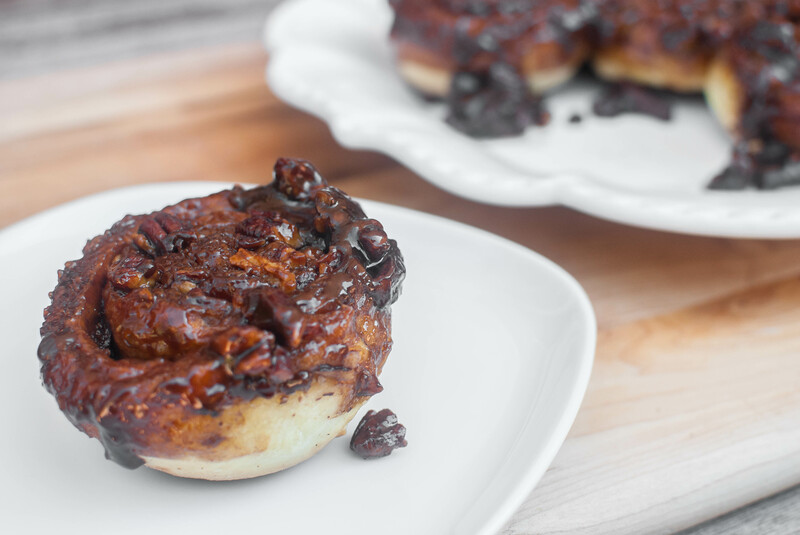 There really is nothing like waking up on a cozy fall morning and settling down with a steaming cup of coffee and a hot pan of ooey gooey cinnamony pecany sticky buns. I’m drooling just thinking about it. 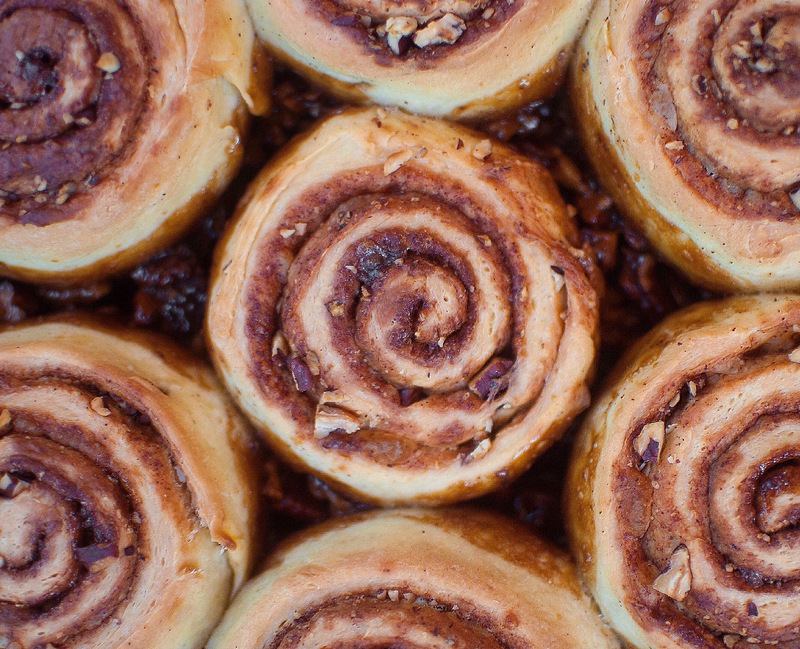 The cast of characters for these buns (adapted from Smitten Kitchen) includes brown sugar, honey, eggs, milk, buttah, and toasted pecans. Honestly, what’s not to like (or love, for that matter)? Oh, and before I forget, here’s a little side note: I halved this recipe, so if your quantities and dough size look a little off, it’s because you’re making double what I made! 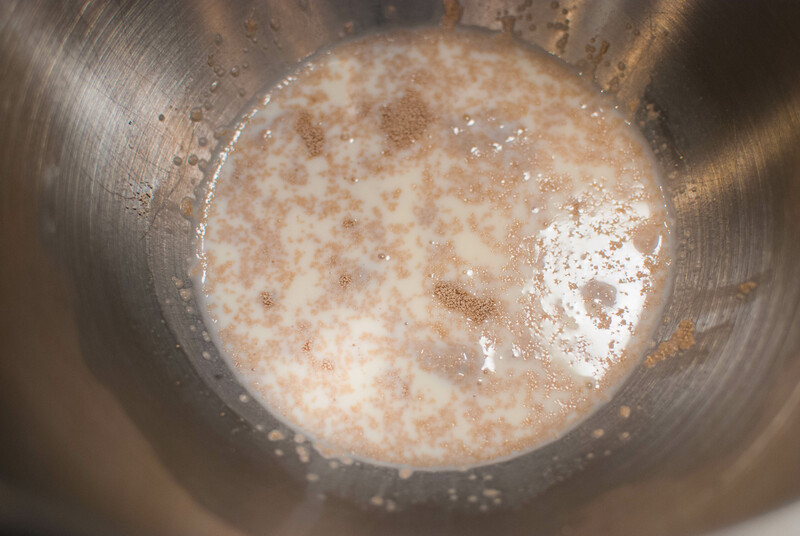 Start by stirring some active dry yeast and a bit of sugar into some warm milk. I just love the smell of yeast for some reason… it makes me think of bakeries and bread and yummy things like that. Wait until your mixture gets nice and foamy, like this! Next, whisk some melted butter, egg yolks and one whole egg into your yeast mixture. Add in half of your flour and use a dough hook to combine everything, then add in the salt and the rest of the flour and continue to mix until a dough forms. 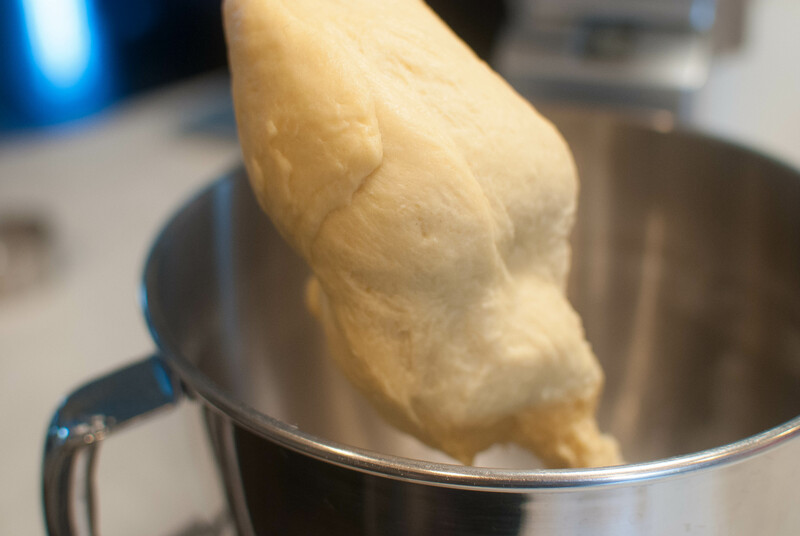 If you’re using a stand mixer, let it knead your dough for 5-7 minutes. If you’re using your hands, go ahead and knead for 5-10 minutes. Either way, you’re looking for a stretchy, elastic dough by the time you’re done. 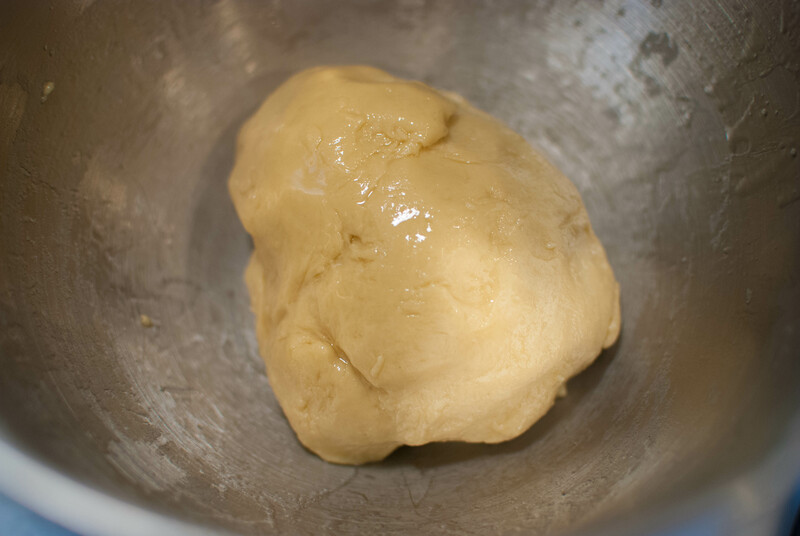 Transfer the dough to a lightly oiled bowl and cover it with a towel or some plastic wrap. Now just set it in a warm place and let it rise for 1 to 1 1/2 hours, or until doubled. Meanwhile, let’s make the caramel (aka the best part). Melt together some butter, brown sugar, honey, cream and salt in a medium saucepan. Bring it all to a boil, then reduce the heat and let it simmer for 3-5 minutes until golden. 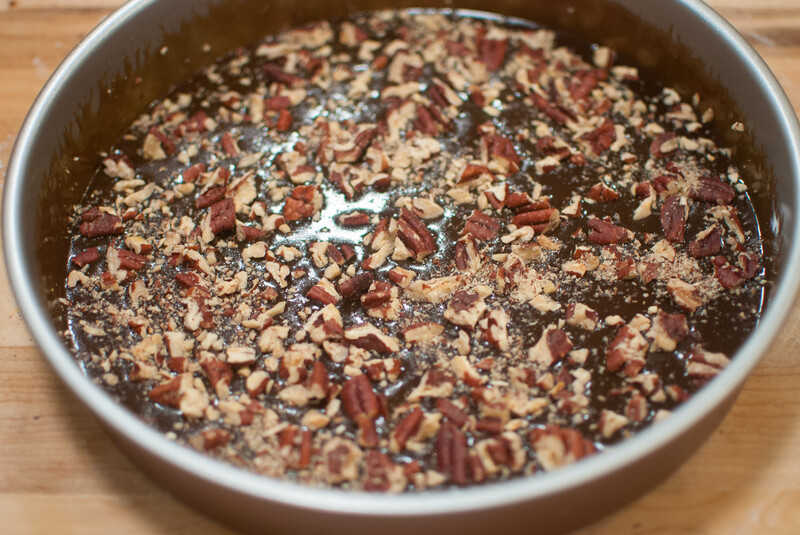 Pour this into a 9×13-inch pan (or two round cake pans if you prefer) and tilt a little to get the caramel up the sides of the pan a little. 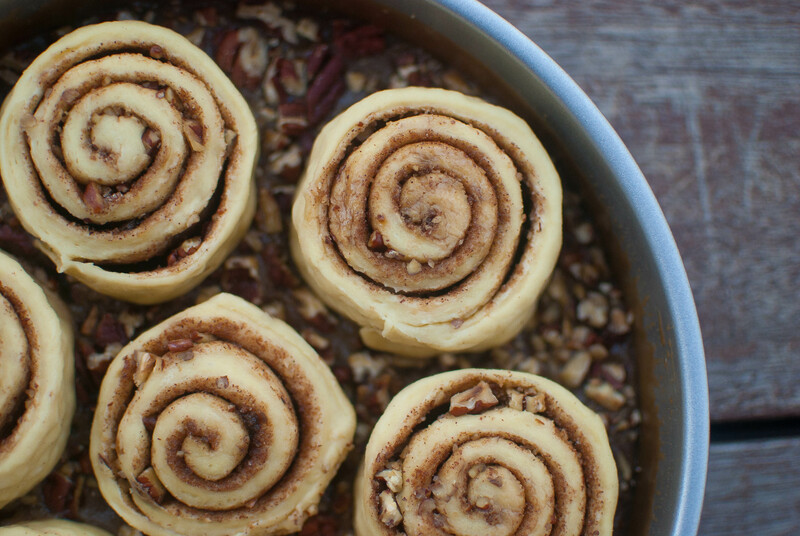 Cool in the fridge for a few minutes, then sprinkle with 1 cup of the pecans and continue to cool in the fridge while you make the rolls! Here’s the magnificent sauce. And here’s that glorious dough. Let’s do this thang. Roll the dough out to 18 inches wide (the side nearest to you) by 12 or so inches long (again, mine was half this size because I cut the recipe). The length doesn’t matter too much, but try to get the width as close to 18 inches as possible. 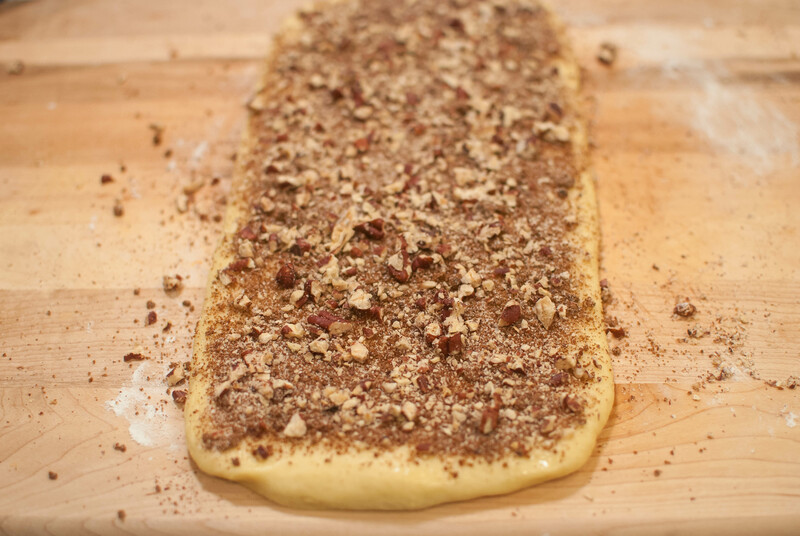 Brush with melted butter and sprinkle the top generously with cinnamon sugar and some more chopped pecans. Now, starting in the back, roll the dough towards you into a tight 18-inch log. Use a serrated knife to carefully cut into 1 1/2 inch rounds (you should get 12, hence the YOUR LOG MUST BE 18 INCHES WIDE nonsense). Time to lay these guys into their caramel base! Now comes a choice: You can either leave these out at room temp for another 1-2 hours, or stick ’em in the fridge overnight and take them out for an hour tomorrow morning. 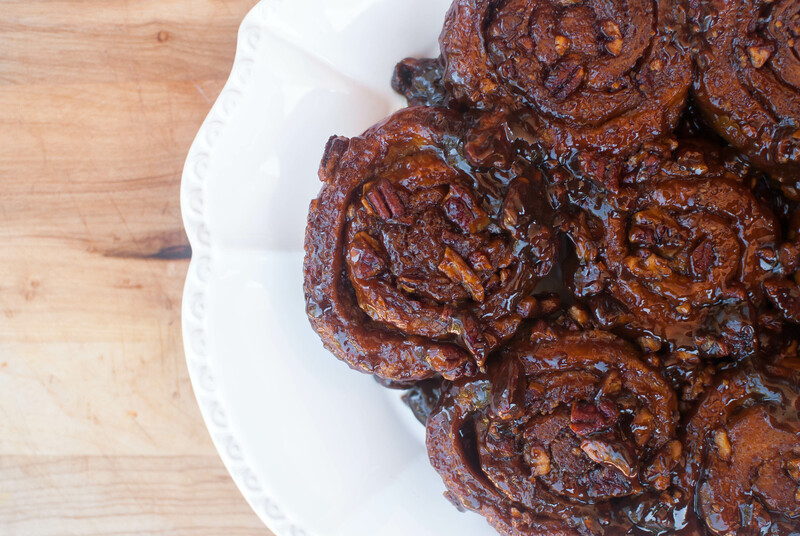 Sticky buns in a few hours or sticky buns first thing in the morning? The decision is up to you. Anyway, when you decide to bake off the buns let them cook in a 350 F oven for 30-40 minutes, or until they’re all puffed and golden and bubbly and beautiful. If the tops are browning too fast, just cover with foil! And when you’re ready, invert the rolls onto a nice big serving plate. Ok, I’m just kidding. Kind of. For the dough: Warm the milk until it’s lukewarm (not hot), about 110 degrees. 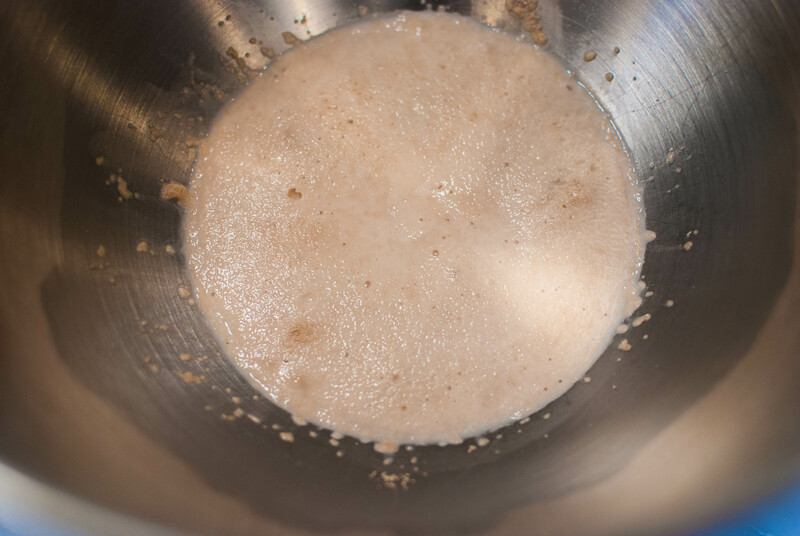 In a large bowl or the bowl of a stand mixer, whisk together the milk, yeast, and tablespoon of sugar and set aside until foamy, about 5 minutes. Whisk in melted butter, egg yolks and whole egg. Add in half of your flour and use a dough hook to combine everything, then add in the salt and the rest of the flour and continue to mix until a dough forms. If you’re using a stand mixer, let it knead your dough for 5-7 minutes. If you’re using your hands, go ahead and knead for 5-10 minutes. Either way, you’re looking for a stretchy, elastic dough by the time you’re done. 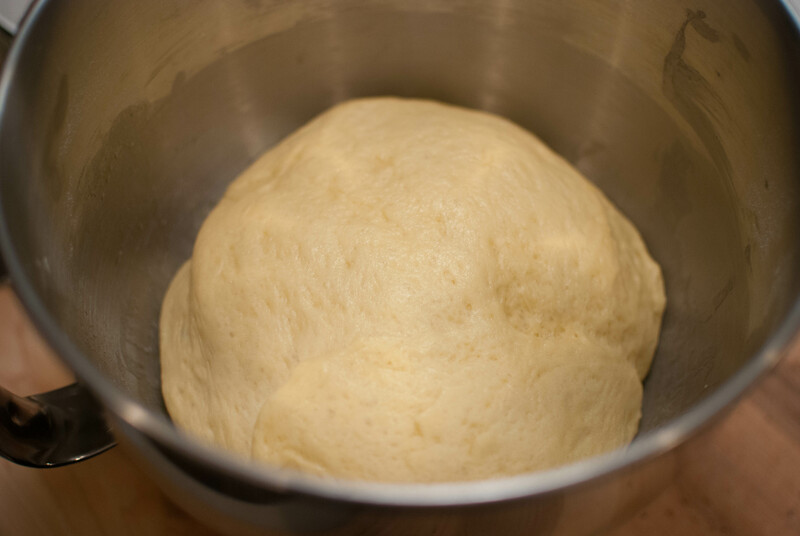 Transfer the dough to a lightly oiled bowl and cover it with a towel or some plastic wrap. Now just set it in a warm place and let it rise for 1 to 1 1/2 hours, or until doubled. About 45 minutes before the dough is done rising, make the caramel: Melt together butter, brown sugar, honey, cream and salt in a medium saucepan. Bring it all to a boil, then reduce the heat and let it simmer for 3-5 minutes until golden. 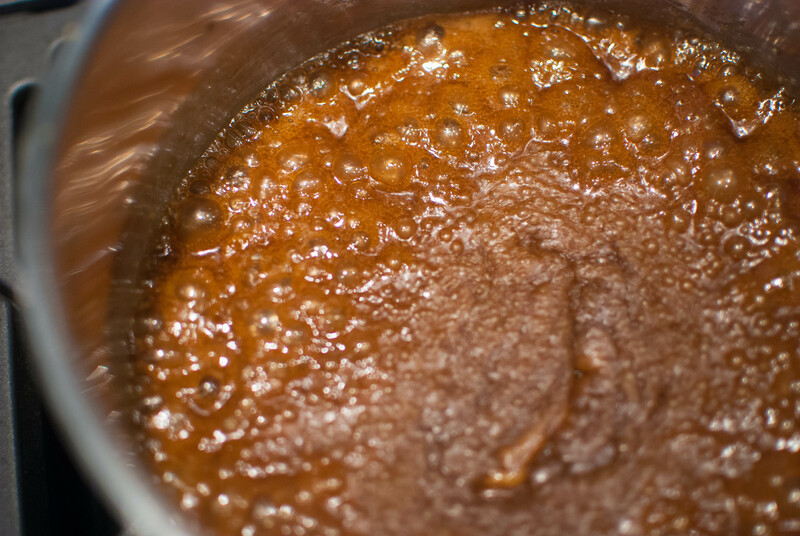 Pour this into a 9×13-inch pan (or two round cake pans if you prefer) and tilt a little to get the caramel up the sides of the pan a little. 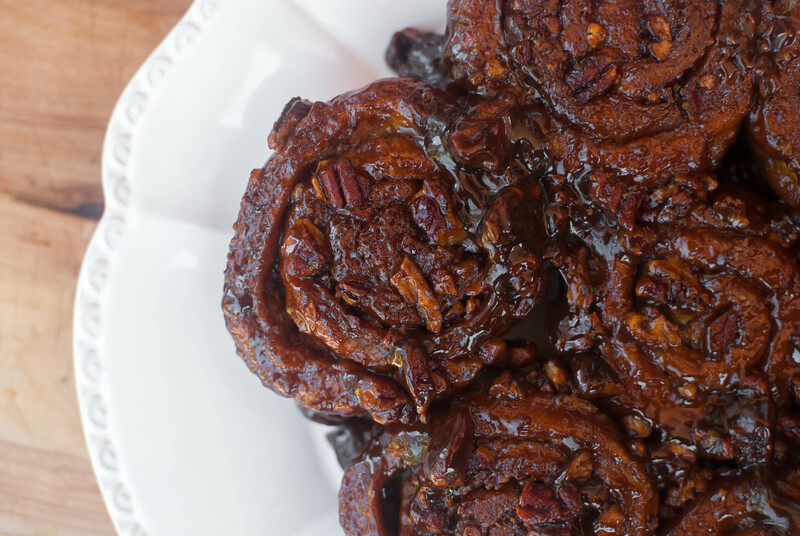 Cool in the fridge for a few minutes, then sprinkle with 1 cup of the pecans and continue to cool in the fridge while you make the rolls. For the assembly: Mix together the sugars, cinnamon and salt in a small bowl. On a floured surface, roll the dough out to 18 inches wide (the side nearest to you) by 12 or so inches long. The length doesn’t matter too much, but try to get the width as close to 18 inches as possible. Brush with melted butter and sprinkle the top with cinnamon sugar (it’ll seem like a lot) and the remaining chopped pecans. Now, starting in the back, roll the dough towards you into a tight 18-inch log. Use a serrated knife to carefully cut into 1 1/2 inch rounds (you should get 12). Place the rolls in the caramel-coated pan. Either let cover and rise for another 1-2 hours (until puffed up) at room temp or stick them in the fridge overnight (if doing this, take them out an hour before you want to bake them). When you’re ready to bake, put them in a 350 F oven for 30-40 minutes, until golden and bubbly (cover with foil if they start to brown too much). Cool a few minutes, then invert onto a serving plate and EAT!